My decision to foster came in steps. It wasn’t a black and white “okay, let me go pick out my first foster now” thought. It started slowly with a shared foster, and has turned into two full time fosters since then. Those of you who have dogs, foster or forever, certainly know what I mean by full time. I am a parent to these dogs, as crazy of a concept as that is. Sure, it’s temporary, but that doesn’t mean the daily commitment to them during their time with me is anything less than if they were mine forever. I am the only one of my friends who has a dog. I am the only one who has to factor a dog into my social schedule, who has to accommodate plans for a dog on weekend trips, who has to account for foster expenses in my “fun” budget. It’s a commitment that I feel like I’m constantly trying to balance with living my life as a twenty-something. Sometimes it feels like a double life – with one half being a life my friends can hardly comprehend. I don’t blame them, seeing as it’s a far cry from the life of an “average” (whatever that means) 22 year old. Rescuing and fostering dogs can be difficult, and sometimes I do wonder what the heck am I doing… am I giving up too much of the only time in my life I have to be young and care free and responsible for no one but myself? This is where a few saving graces come in the picture, the first being my parents. While many college graduates move out of their parents’ house faster than you can say, “Congratulations,” I am beyond thankful that I am in a position to be staying with mine. I can very honestly say I don’t think I could handle – let alone particularly want to try – fostering a dog if living by myself at this age. My parents help me immeasurable amounts when it comes to balancing my dogs and my friends. They will watch my foster dogs pretty much whenever I ask them to – regardless of whether it’s because I need to stay late for work or if I want to grab drinks with a friend. They are so much like grandparents in the giving-mommy-a-break category, and now I know why mothers to human babies relish that free time so much! Choosing more “ready to go” dogs makes fostering better for everyone around me. Otis is nearly perfect at home when I’m not there, which makes it easy for my parents to watch him and puts my mind at ease. On the other hand, if you like a challenge – good for you! I commend those that take in the pups who need a little something extra, and hope to some day be able to provide the stability and training a dog like that may need. While fostering dogs at my age can often be exhausting and confusing and scary and overwhelming, it’s also instilling a deep, deep passion in me that I will carry for the rest of my life. I’m learning that helping dogs is what I was put here to do, and starting it this early is teaching me discipline, responsibility, critical thinking, compassion, practicality, rationality, communication and maturity – not to mention creativity, writing and photography thanks to this blog. This entry was posted in Dog talk, Former Fosters, Otis, Photography, Rescue/Humane Society, Uncategorized and tagged 22, dogs, early twenties, education, fostering, growing up, learning, maturity, rescue. Bookmark the permalink. Thanks! and yep, no matter what age! Great post. We were in kind of a similar spot with Harley, though not a foster. 23, with a choice let the pup go to a shelter, or take her in. We made the choice to take her. We have had to sacrifice along the way ( both because we were young and because Harley has special needs) but it is one of the most rewarding things I have ever done, I love her to pieces. Having her has taught me about dogs, has bought me to a wonderful community of dog lovers, and has taugh me so much about patience puppy training and doggie cuddles!! It’s so worth it, right? :) Sometimes I wish I had someone else that was totally 100% on board with me so that I wasn’t making these sacrafices alone (my boyfriend is supportive but he certainly wouldn’t choose this life for himself) but that’s why I’m so thankful for my parents. If I didn’t have that break or someone else with me to help I really couldn’t do it. Good job for saving Harley! Awesome post! You’re awesome too…keep up the good work. Nice pictures and good luck on your foster mommy journey. I am right there with you girl!! I am 25, live on my own with my 7 year old daughter, have my own dog and cat, and still foster all the time! I have been fostering since October and I am currently on my 13th dog! It is quite the rewarding experience and I definitely encourage you and others to continue doing it. What a great post!! I’ve been thinking about fostering for a year or so and although our concerns are different (I’m a wee bit beyond my 20s ;)), it would change my life in ways I need to fully consider. I have a dog and cat; I travel; I have gobs of nieces and nephews with whom I can always have my dogs around, etc. But I think when my schedule opens up on the fall I’m going to take the plunge. Thanks for the encouragement! You’ll do great! What I would recommend for your first one is take the most adoptable dog you can – you’ll still be opening a spot in the shelter for someone else! Then hopefully they won’t be with you for too long and they’ll fit the best they can in your family and it will be a very positive experience. As nice as an “it can only go up from here” experience would be your first time around, you probably want to spare yourself some stress. Also you should consider fostering kittens… shelters are ALWAYS in need of kitten fosters and they’re way easier than committing to a dog. Good luck! You’ll have to report back on how it goes!! Let me start by saying, Thank You for caring enough to foster dogs. Yes, it is a big commitment, regardless of whether or not they are yours or fosters. You put the same amount of love, time, commitment, etc. For a 22 year old you are quite mature. Please tell your parents thank you for me as well. By the way, I refer to pet owners as pet parents because we really are parents just of the canine kind. You are right, and I am so glad you’ve realized that when you have a dog your life will change because anything you may want to do would be by taking into account that you are responsible for your dog. Also, you should choose a dog that fits your lifestyle. You really know your stuff:) Thanks again from all pet parents like myself. No problem. I love your input because many times people adopt or foster dogs that do not suit their lifestyle nor their energy level. Your welcome. People like you make me realize that love and compassion is still out there. What you are doing is amazingly wonderful and so much more rewarding than what I was doing at 22…simply trust me on this. Although fostering isn’t a walk in the park (ok, sometimes it literally is), the memories you are making are life defining (for you), lifesaving (for them), and hopefully life changing (for all those people that you are sharing your experience with)! This world of ours NEEDS more people like you! Great post. I stated at 25 when my boyfriend and I moved in together. Of course, our first foster was Corbin, and clearly… he didn’t leave! I still had a lot of fun 20 times, but life definitely settled down when we got Corbin, and especially this year with Corbin’s health issues. He’s not able to enjoy the lake with us, so I find myself staying home just about every weekend with him. Although it can be a bummer, it’s also allowed me to foster more during the summer and when I’m 80 something (hopefully! ), I’ll look back and know that I made a difference for those dogs who otherwise wouldn’t have had a future. For me, as I’m sure for you, it’s worth missing out on those late nights at the bar every weekend. Love this post!!! I too feel like my friends are like “your going home for the dog?! LAME” but it is what it is… and I know at the end of the day this is my decision. enjoy your parents support while you have it! You are doing such an amazing thing at 22 years old– props lady!!! I have been following you for awhile and have really enjoyed reading your posts. In fact, your blog (along with a couple others) encouraged me to adopt and it has been a wonderful journey. I am so thankful to you and my girl’s foster Mom for making the transition into my home so easy. Foster’s and especially those that blog help so much in understanding the needs of your dog before you adopt. I am older and retired and it was important to me that I adopt a dog that fit into my lifestyle and health needs….especially when adopting a “strong” dog like a pit/mix. My Lucy joined our family almost 2 months ago and she is just about perfect for me. We are working on loose leash walking as that is my only concern/problem with this wonderful dog. And I knew most of this before she came thanks to her foster mom who is now a friend and will always have a place in Lucy’s life. Thank you for all you do. I am sure that when Otie finds his permanent home his adopters will feel the same about you. God bless you for what you do…….and tell your parents that they should be proud of themselves for teaching their daughter compassion and wisdom. I think it’s great that you’re fostering… it can be really hard sometimes but in the end it’s so rewarding. You get to see a life changed before you, it’s a great feeling. And, these dogs are so lucky to have someone as compassionate as you to help them on their journey. Such a sweet story! It’s awesome to heaethe about the work you’re doing. I’m 22, but I can’t tell you what a “normal” 22 yo is like, either. I’m married with a full time career, and we bought our first house last year. We have a 1 1/2 yo American Pit Bull Terrier (Axle) and 2 “failed foster” kitties. We’re hoping to one day foster elder-dogs. :) I spend at least one day a week volunteering at our local shelter. It’s so hard to leave them there! Most of my friends are in college or live at home, and animals aren’t really a consideration for them, either. I wish I had grandparents to watch mine!! I kind of wish I’d gotten into fostering when I was young, perhaps then I would have discovered my passion for dogs much earlier and saved myself a lot of angst! It’s fantastic you have had the ambition and spirit to just get right in there and start doing. Not everyone is brave enough to try something new, especially something as seemingly daunting as fostering “pit bull” type dogs. You are an inspiration. Thanks for all you have done and thanks even more for all you will do. Hi! I’m new to your blog (I found it via a Heartbeat at my Feet, I think), and I love it. I am 28, my fiance is 24 and we have a cat (mine…a Ragdoll I adopted from my boss) and a pittie/Shepherd mix (his). We often hear “Awww, you’re going home for the animals! ?” from his friends who want to stay at the bar until closing. 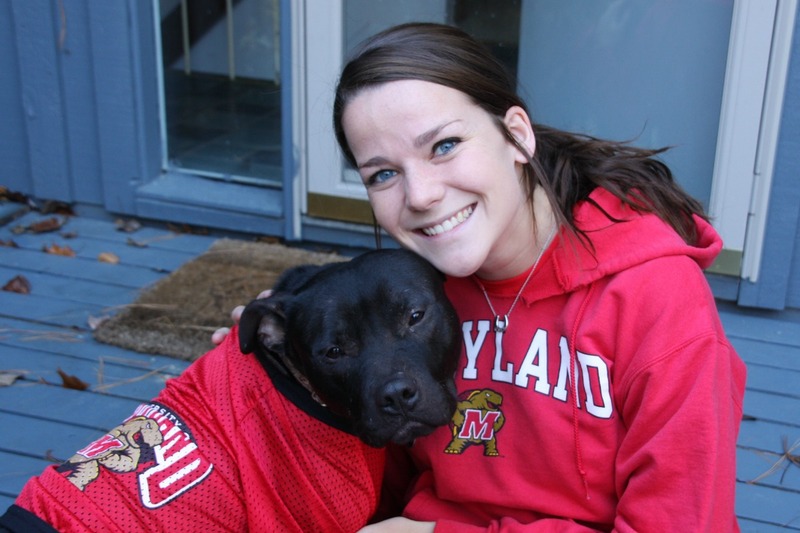 Through reading your blog and AHAMF and all the other pro-pittie fostering blogs I want to volunteer at a shelter at some point. Thank you for sharing your experience with the world, and inspiring people. Thank you for sharing your story. I am a single mother of a two year old son and recently decided to foster. He was a 2 year old pit/dogo argentino mix. We discovered the Dogo part later because I couldn’t believe how much larger he was than his pictures led me to believe. He was gentle with my son and housetrained, but had no other training or manners. I quickly found out that he did not fit my lifestyle or my abilities. It broke my heart to be a foster failure and not in the good sense, but I know that in the long run admitting he needed a more experienced foster and trainer will benefit him in the end. I hope to try fostering again with a smaller more manageable pit. Thanks for making me feel like I’m not the only one who needs a less intensive foster dog. I’m with you on this one! I’m 23 with a 4 year old lab and a 6 month old pitbull I adopted a month ago. My fiancee and I bought a house and I moved out with my lab in Feb…having dogs certainly cuts back on your social life, but I wouldnt change it for the world. Keep up the great work. 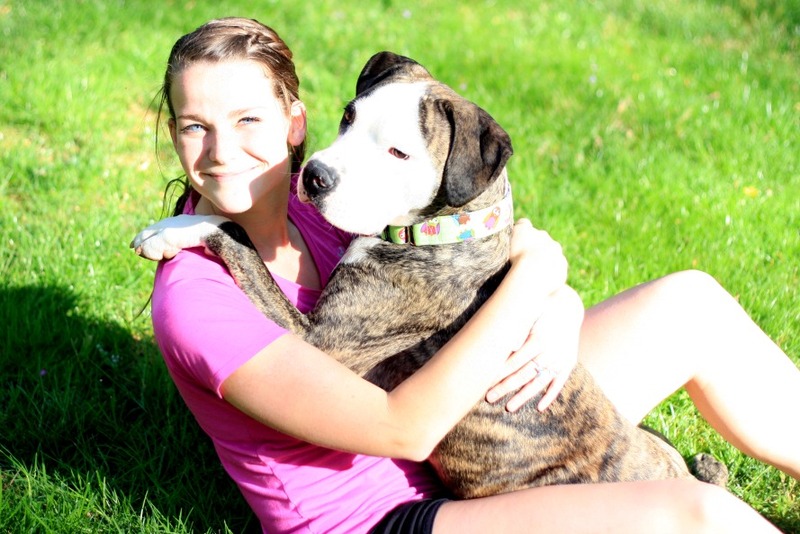 Your blog is one of the reasons we were inspired to adopt the 6 month old pitbull. Count me in as a “younger-than-average” foster mom! I just turned 23 two days ago, and I started fostering within the last year as well! In fact, I just adopted out my first pit-bull type dog … literally this morning, so he doesn’t even have a “He’s Home!” post up yet. Oh you are a young woman after my own heart! I’ve been working in and out of fostering and rescuing (both humanoid and furryoid) for a long time and I applaud you for your realistic outlook on your part in this struggle to save the pets of the world. I know sounds dramatic, but it is a fight for them. Kudos to your parents as well!!! I couldn’t have done my human fostering and then adoption without them. It’s just as much work for them too. Keep on doing what you are because it will only trickle over to others when they see your determination and courage. Opportunities abound for educating others as well. Beautiful!!!! We are the next generation of rescuers!!!! !